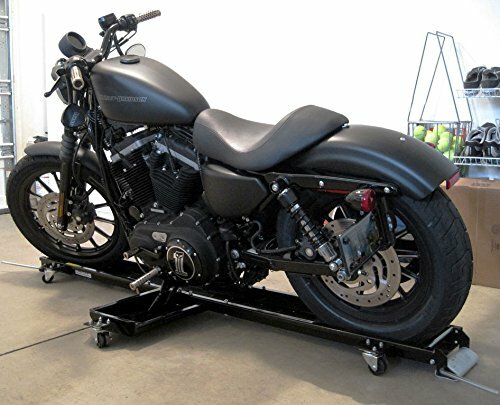 The Motorcycle dolly is probably the single most useful piece of biking related kit you could have in your garage. If you’re anything like us, you will probably have found yourself doing the backwards and forwards shuffle as you try to work around your bikes poor steering angle when manoeuvring your bike through tight spaces. It isn’t fun and can be downright annoying. The motorcycle dolly is the answer to all of your problems. 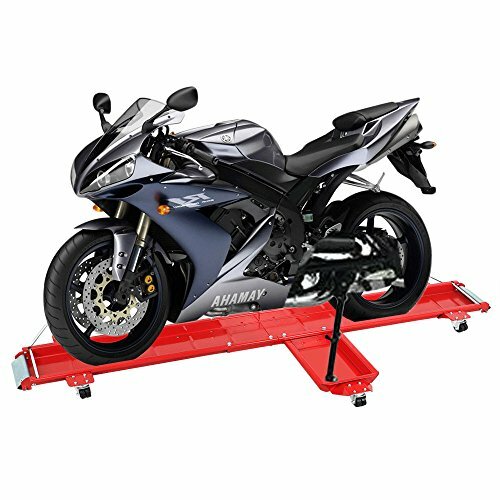 Essentially acting as a trolley, once your bike is loaded into place, you’re able to easily wheel it around inside your garage or out, any way you please. We wish we had invested in one sooner so don’t make the same mistake and buy yourself a motorcycle dolly today. This review will take you through the best on the market in terms of price to value ratio. Grab a drink, settle into your favourite chair and prepare to be enlightened. The Black Widow offers everything that you need in a dolly. Its full size, meaning that it can easily carry a cruiser and it can support a maximum payload of 1250 lbs. There is no production bike available on the market weighing more than 1250 lbs. The kickstand plate is adjustable and features three different positions that allow you to customise the positioning to your bike, giving you plenty of choice even for smaller bikes such as motocross and street bikes. The dolly itself weights 80 lbs once assembled making it lightweight and easily transported. You could even transport your bike whilst strapped to this dolly if you so wish. 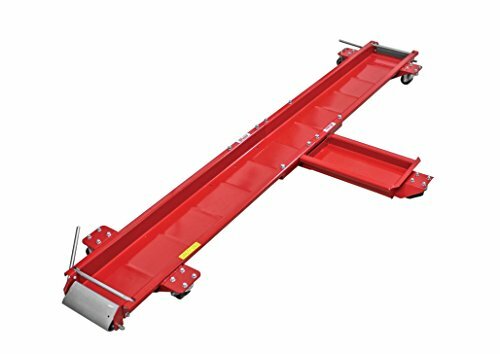 Great for those of you with access to a vehicle with a tail lift. The castor wheels are high in quality and we didn’t notice any excessive play or weakness in them once assembled so we’re confident that this dolly will serve you for years to come. If you have a big bike, this one’s for you. Our second choice for those of you with bigger bikes. The Extreme Max comes in two sizes (76 inch and 91 inch) depending on what you ride which is useful. We see no reason to buy a longer heavier dolly if you ride a supersport or naked bike. The maximum load capacity is again a useful 1250 lbs so you could happily carry any bike even with its luggage in place. The build quality is up there with the Black Widow with a series of design features that show this model really means business. The castor wheels are oversized and reinforced and the dolly tray is sturdy and well designed. The red paint has been applied using powder coating so should be hard wearing and will protect from rust and corrosion. You also get your adjustable kick plate which we love. We didn’t like the fact that it came with no instructions. I know some of us don’t like to read them but they’re useful nonetheless. Bear this is mind as it might take you longer to put it together than anticipated. All in all, the Extreme Max makes a great buy, coming in slightly cheaper than the Black Widow whilst offering similar features. 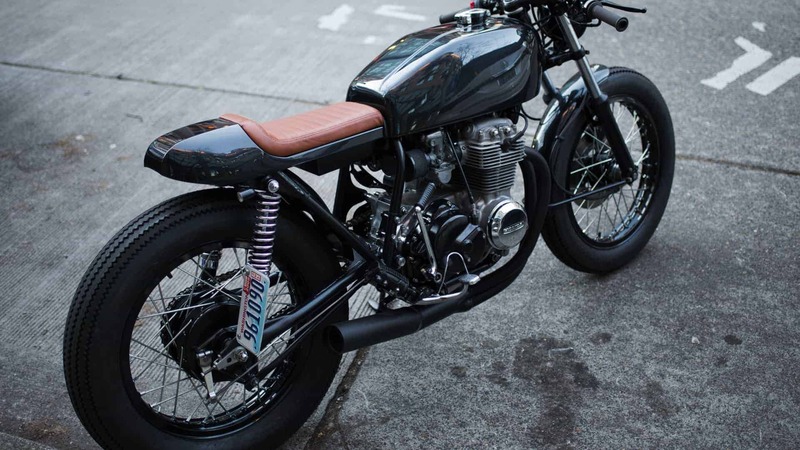 Black Widow’s MC is designed for all of those small to mid sized bike owners out there. You’re getting exactly the same features of the larger cruiser model but in a smaller package. If you don’t own a long wheelbase bike then this dolly will serve you perfectly well and will cost you less too. Weighing in at 70 lbs and with a usable length of 76 inches, this dolly is perfect for track days, general storage and moving your bike around at home. Do keep in mind that the widest rear tyre you’ll get on the deck is a 190 section. The instructions present are also limited so put a few hours aside for this one. Although overkill for most people, we feel the Condor deserves an honourable mention. 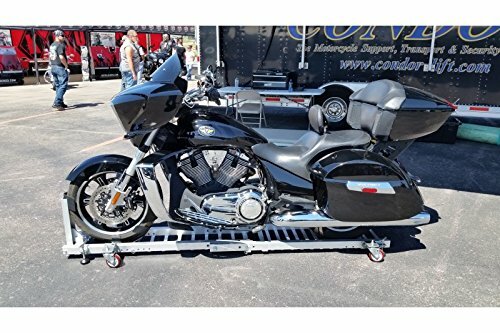 This device is clearly the Rolls Royce of motorcycle dollies and it shows in its feature set with a price tag to match. Condor have gone for an alternative type of construction which closely resembles a ladder rather than a tray as is seen on the other models on test. The benefit to this is that you’re able to load any motorcycle onto it regardless of tyre width. Even those super wide 260 section tyres will be right at home here. We love the design, its usability and its construction quality but we just can’t get over the price. At just under $500 dollars, this thing is certainly not cheap and would best be used in a commercial workshop rather than as a tool to only occasionally use at home. That being said, if you can afford it, buy it. Its feature set is unrivalled and as we say, it looks awesome. The Low Profile dolly does most things the other dollies here do but just not as well. Suitable for small to medium sized bikes, this dolly will take anything that doesn’t have too wide of a rear wheel. You’re realistically looking at no wider than a 180 section rear tyre as found on most large capacity sports bikes. What we didn’t like is that this dolly just loves to move around when you’re trying to load it. A brake system would be useful as otherwise you do spend a lot of time effectively chasing it around the garage. Once the bike is finally in place, it does its job and is easy to manoeuvre as you would expect. In its favour, the Low Profile is one of the cheapest motorcycle dollies available and is built fairly well. If you’re on a budget, this one is for you. And there you go guys, short sweet and simple. 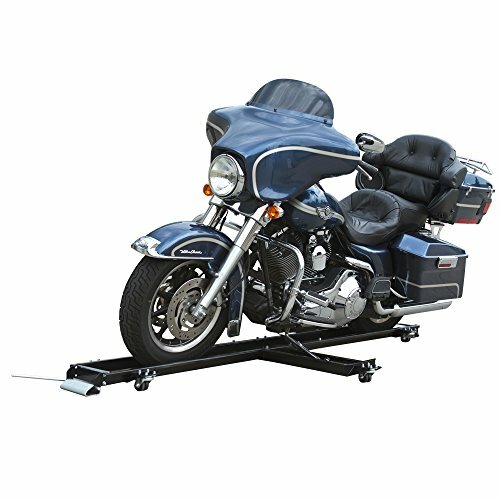 If you intend to use one of these motorcycle dollies to assist you in transporting your bike in the back of a truck, we suggest that you also invest in some tie down straps. This will prevent the bike from falling over and keep the dolly in place as you drive around.